Can You Guess the 3 Most Common Causes of Brain Injury in California? Home » Blog » Can You Guess the 3 Most Common Causes of Brain Injury in California? One of the worst possible injuries a person can survive is a traumatic brain injury. These injuries can range from a mild concussion to a life-changing reduction in brain function. At Law Offices of Michael A. Kahn we help those affected by these injuries, including both victims and their families, to recover. Contact us now at (310) 209-1600 and we will get started with a free legal consultation. 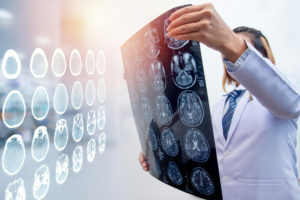 Before we discuss the three most common causes of traumatic brain injury, let us discuss what we mean by the term “traumatic brain injury.” Also known by the acronym TBI, this injury is one that causes physical damage to the brain. The effects can include either physical or psychological problems, or both. The part of the brain that was injured will affect the consequences. For example, damage to the front of the brain generally causes speech and language issues, while damage to the temporal lobes can result in changes to behavior. Car accidents. A car accident can injure the spinal cord, head, and neck. This can occur due to abrupt stops or the head having direct impact with an object. Work accidents. Any type of work environment has the potential to cause a brain injury, though certain injuries have higher risks than others. Any workplace with heavy tools or machinery likely has a higher instance of traumatic brain injuries. Falls. The higher a person falls, the more likely they are to have a TBI. However, it can happen at any elevation. People fall from ladders, roofs, and even stairs. It is not uncommon for a person to not immediately know that they have suffered from a brain injury. This is due in part to the fact that in many cases, the long-term damage comes from swelling of the brain, which does not necessarily happen immediately. This is why we always recommend that anyone who has suffered a head injury goes to the emergency room for immediate care. While you may not have suffered a serious injury, it is much better to be safe than sorry. The right way to treat any particular TBI will depend on how serious the injury is and how quickly it was diagnosed. In most cases, a long-term treatment plan will not be created until the patient has stabilized and doctors can assess the damage. No matter what the treatment plan is, you will have an easier time paying for it if the at-fault party is held responsible for their actions. We can do that at Law Offices of Michael A. Kahn. Call us now at (310) 209-1600 for a free legal consultation.